Imprimatur: Thomas D. Beven, Bishop of Springfield, Ma. Pope Eugenius III, at the earnest request of St. Bernard, has granted three thousand years Indulgence to all who with a contrite heart, recite the Lord's Prayer and Hail Mary 3 times, in honor of the Wound on the Shoulder of Our Blessed Redeemer. Our Father, Hail Mary, Glory be to the Father. 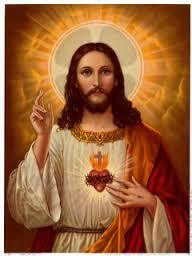 Sacred Heart of Jesus I put all my trust in Thee. Our Father, Hail Mary, Glory be to the Father. Sacred Heart of Jesus, I put all my trust in Thee. Say the Salve Regina and add, St. Joseph, foster father of Jesus, pray for us. P.S. - This novena prayer was recited every day by Padre Pio for all those who recommended themselves to his prayers. "Eternal Father, I offer Thee the Body and Blood, Soul and Divinity of Thy Most Beloved Son and our Lord and Saviour Jesus Christ, in atonement for our sins and the sins of the whole world." On the HAIL MARY BEADS say the following words: For the sake of His sorrowful Passion have mercy on us and the whole world. In conclusion say THREE TIMES these words: Holy God, Holy Mighty One, Holy Immortal One, have mercy on us and on the whole world. 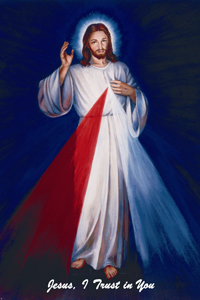 At three o’clock implore My mercy especially for sinners; and, if only for a brief moment, steep yourself in My Passion, particularly in My abandonment at the moment of agony. This is the hour of great mercy for the whole world. . . . In this hour I will refuse nothing to the soul that makes a request of Me in virtue of My Passion. Copy of a letter of the Oration found in the Holy Sepulchre of Our Lord Jesus Christ in Jerusalem, preserved in a silver box by His Holiness and by the Emporers and Empresses of the Christian Faith. In olden times, people were religious, and their harvests were abundant; at present, on the contrary, they are scanty. If you want to reap an abundant harvest you must not work on Sunday, for Sunday you must go to Church and pray to God to forgive your sins. He gave you six days in which to work and one for rest and devotion and to tender your help to the poor and assist the Church. Those people who brawl against My Religion and cast slurs on this Sacred Letter will be forsaken by Me. Women in peril at child-birth will, by keeping this Oration about them, immediately overcome the difficulty. In the houses where this Oration is kept, no evil thing will ever happen: and forty days before the death of a person who has this Oration about him or her, the Blessed Virgin will appear to him or her. So said St. Gregorious. 1st The plenary indulgence and remission of your sins. 2nd You will be free from the pains of Purgatory. 3rd If you should die before completing the said 3 years, for you it will be the same as if you had completed them. 4th It will be upon your death the same as if you had shed all your blood for the Holy Faith. 5th I will descend from Heaven to take your soul and that of your relatives, until the fourth generation. Be it known that the number of armed soldiers were 150; those who trailed me while I was bound were 23. The number of executioners of justice were 83; the blows received on my head were 150; those on my stomach, 108; kicks on my shoulders, 80. I was led, bound with cords by the hair, 24 times; spits in the face were 180; I was beaten on the body 6666 times; beaten on the head, 110 times. I was roughly pushed, and at 12 o'clock was lifted up by the hair; pricked with thorns and pulled by the beard 23 times; received 20 wounds on the head; thorns of marine junks, 72; pricks of thorns in the head, 110; mortal thorns in the forhead, 3. I was afterwards flogged and dressed as a mocked king; wounds in the body, 1000. 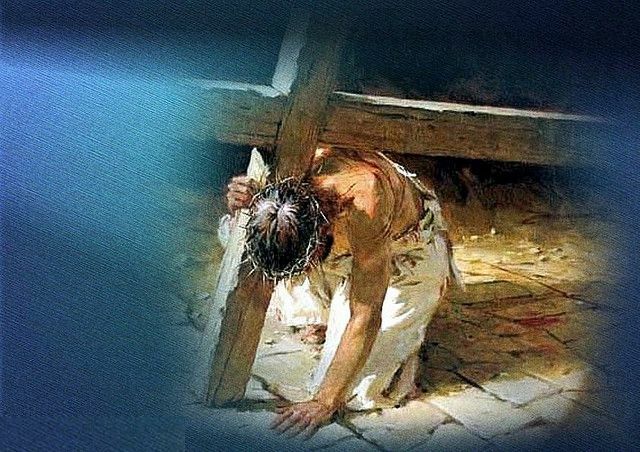 The soldiers who led me to the Calvary were 608; those who watched me were 3, and those who mocked me were 1008; the drops of blood which I lost were 28,430. “A certain Spanish Captain travelling by land saw, near Barcelona, a head severed from the body, which spoke to him as follows: “As you are bound for Barcelona, my good man, for God’s sake send hither a Priest so that I may confess myself. It is already three days now that I have been attacked by robbers, and I cannot die without first confessing myself.” The Captain brought the Confessor to the place; the living head confessed, then expired. On the body from which the head had been severed, the present Oration (the True Letter of Our Saviour Jesus Christ) was found. On that occasion it was approved by several Tribunals of the Holy Inquisition and by the Queen of Spain. The said Our Fathers, Hail Marys and Glory Be can be recited for the benefit for any soul. At the time of the terrible earthquake in Northern Italy and in France, a girl from Nice named Nathaline was caught under a fallen house and remained three days buried alive. When unearthed, a copy of this Letter was found on her! She was illiterate and uneducated. When found she was sleeping, untouched by the devastation of the earthquake! On March 12, 1821, many emigrants from S. Giovanni Incario, in the Province of Caserta (Italy) sailed for America to look for work. During the trip they were caught in a most terrible storm which threw their ship into collision with a warship. This caused it to sink. The event occurred on the 19th March, St Joseph’s Day. Out of the 667 people on board, only 9 were saved. Every one of them had a copy of this Letter of Christ in his possession. The survivors were found almost naked, wearing only their vests, in the pockets of which the Letters were found dry, not even wrinkled! Another miracle of the Sacred Letter of Jesus Christ was revealed at the island of Iri, also in Italy. A man was peacefully sleeping in his bed, when a mysterious hand shook him abruptly and a voice thundered: “Get up in haste, and save yourself in a corner of the house!” Promptly complying with the divine warning, the man rose and reached, pale and trembling, a remote corner, just in time to see the floor where he had lain in bed, sink into a deep abyss. This Letter saved him. Another miracle was accomplished by the “Mater Dolorosa”, three miles from the town of Castelpetrosa, in the Province of Campobasso, Italy. A 13 year old shepherdess, named. Maria Grazia Estassia Bibiana, was attending her duties in the vicinity of an old Convent. Suddenly appeared to her, and to her astonished mother who was nearby, the Virgin Mater Dolorosa, who told them: “Come with me to this old Church, wherein my Son shall celebrate the Mass.” At the end of the Service, the Virgin thus spoke to them: “My Son is vexed with the people of this world, as there are too many sins committed, vice is rampant everywhere; religion is neglected. Therefore destructive earthquakes, pestilence and famine are putting humanity to severe punishment. Go to Church, do not sin, make regularly your confession and receive Holy Communion at least once a year. Thus, He will pardon your sins.” Then the Virgin disappeared.